Seiken Densetsu: Legend of Mana was released in 1999/2000 for Sony's PSX. 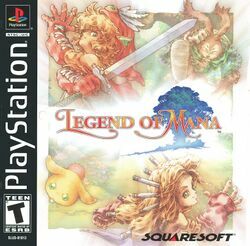 Legend of Mana (LM) puts you in a fantasy world, full of mystic, even sometimes bizarre, creatures, like live teapots, onion-warriors etc. There is a two-player mode, where a second player can control a second character in the party. This page was last edited on 3 August 2016, at 20:34. This page has been accessed 15,981 times.